Welcome to the best practical and easy-to-understand information on Wildflower Gardening. These are our own illustrated articles, based on work with wildgardeners all over North America for over 25 years. All of the seed that we sell at American Meadows is lab tested to ensure the highest purity and germination possible. 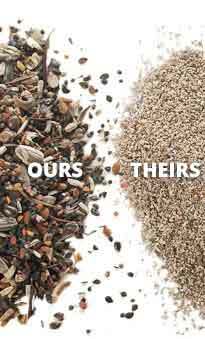 We do not buy or sell ANY genetically modified seeds (GMO). This is our "Bible" for planting wildflowers in any region, any season. It's in plain English, and based on work with millions of wild gardeners all over No. America for 25 yrs. Here's simple, clear info on coverage. How to quickly estimate your area's size in sq. ft, and how to choose seed for a "meadow look" planting or one of solid wildflowers. There are about 10 questions any new wild gardener always asks—for example, "When will I see blooms? ", "How do I tell weeds from wildflowers?" Here are the answers. After seeding and tending wildflower meadows for over 20 years, we’ve learned a lot. Most of our work has been done in Vermont, but by working with wildgardeners from all over North America for over two decades, we also learned which plants do best in various areas. When will your annual flowers be killed by frost? When will your gardening season end? This chart tells it all by giving you cities coast to coast and their "first killing frost date." Just check out your nearby cities, and you'll know when to expect it will happen. Here's how to expand your bloom season by up to two months using easy-to-grow, perennial bulbs. They're always available, and require absolutely no care. Be sure your wildflower garden includes the "other wildflowers"—wild tulips, wild daffodils, and wild lilies. We hear the question all the time: "What's the best time to plant wildflower seeds in fall, in my area?" This article answers the question and more. It also relates wildflower planting to fall bulb planting time--sometimes doing both at once can save a lot of work. After your seed is planted, you'll have these questions. Here are the answers. For questions like "What's that blue one?" "When will the poppies bloom?" "How about the perennials?" All the answers are here, in simple plain talk. Unless you already know, you must understand the simple differences between the 2 basic types of flower plants. Once you do, everything else makes sense. Don't be a "Perennials Only" snob! Many gardeners miss a big thrill by ignoring the wild annuals. In Wildflower Meadows, they're important to a meadow's success. Even though spring will always be the No. 1 season, fall planting has definite advantages. After all, when you think about it, nature plants wildflowers in the fall! When winter wipes out everything in your garden, take heart. Wildflowers are always in bloom on the internet. Here are some recommended sites. After you've enjoyed a wildflower garden for awhile, it always comes to mind: What about Wild Roses? Here are the facts about some of the world's most beautiful wildflowers. Here's how we created our woodland garden, and tips for yours. A success story with some of America's most treasured native wildflowers and ferns. One of the most familiar insects in the world is the honey bee. Honey bees are social insects. In the wild, they create elaborate nests called hives containing up to 20,000 individuals during the summer months. Colony collapse disorder (or CCD) is a phenomenon in which worker bees from a beehive or European honey bee colony abruptly disappear. The cause or causes of the syndrome are not yet fully understood, although many authorities are making progress understanding the causes of the disorder. Sounds simple, doesn't it? But a clear definition becomes important when you're actually growing them. Don't confuse "wildflower" with "native". They're not the same. The History of Wildflowers Some of our most common wildflowers are some of the most ancient plants on earth. Here's how we arrived at today's botanical diversity, with pioneers from Ancient Greece onward who led the way. Your friends will think you have a botany degree after reading this short article. Who organized all this stuff? There's medieval magic lurking in today's plant names. Enjoy. How did the Forget-me-Not get it's name? And who was Black-Eyed Susan? Common names are fun and confusing. You'll find that many gardeners who know all about wildflowers, sometimes made up their own! Did you know there are two Earth Days? Actually, there are two dates when the international environmental holiday is celebrated---April 21st and March 20th. With either date, "Earth Day" turns 40 this year, and there is still a controversy over exactly when it began and by whom it was created. Before you move past this article, wait! It's not a complicated subject, and it's in plain English. You need to know this--just the basics. Without it, you can make big mistakes. Back to 8th Grade Biology. We promise this article is not boring or complicated. It's easy to read, and will give you the basic framework you need to understand the wildflowers you're growing. Flower Families are not what one may think they are. This short article makes it all perfectly clear. A quick look at the basics of Medicinal Plants from the Mysteries and Magic of the Middle Ages, through Native lore to today's booming Herbal Medicine industry. Echinacea, anyone? Don't believe everything you read...or hear. This is probably the area about wildflowers that includes the most mis-information of all. Here are the facts. Is it invasive? Prohibited? Regulated? CNN and your favorite magazine have put out lots of incorrect information on this subject. You need the facts. That plant is deadly poison!" "If you eat that flower, you'll be beautiful." Read the famous Legends of Love, Native lore, and other things in this fascinating area of wildflower info. Here's all you need to use any wildflower field guide, reference book, or plant catalog. It's not a big deal, and there aren't that many terms, but without them, you can be lost. Read all about the World's Most Popular Wildflower. Always our No. 1 seller in the seed deptartment, you'll learn why this little flower is the subject of famous poetry and worn every year in the US and UK on military holidays. What is a Wild Rose, anyway? They've been loved and written about for centuries, but this tells you what the actual wild ones are like and where to find them. It also tells you that your Uncle Bruce was probably wrong about the ones at his farm. One of America's most-loved wildflowers is not only the star of one of the most famous "legends of love" among the flowers, but is easy to grow from seed. Read about her several native species and very popular hybrid perennials. From the Pacific to the Coast of Maine, wild lupine species light up almost every state. And their hybrids are favorites in perennial gardens everywhere. As the native home of some of our most treasured wildflowers—such as the Black-Eyed Susan and Echinacea—the American Midwest is world famous for its excellent soils and growing conditions. Many native plants of the region were "discovered" by Lewis and Clark on their expedition in 1803-06. The beautiful blue "Prairie Flax" is named Linum lewisii after Captain Lewis. The entire northeast was covered with primeval forest when our European ancestors arrived, so they were greeted with a rainbow of woodland wildflowers they had never seen. As the forests were cleared, sun-loving wildflowers bloomed, creating a mixture of natives and other meadow flowers that traveled with the colonists from Europe in their seed sacks. This coastal region is known throughout the world as one of the most beautiful places on our planet. The moderate temperatures (compared to our northeastern coast) plus generous rainfall, has made the US Pacific Northwest and neighboring Canadian lands one of our most botanically rich regions, the home of numerous native flowers found nowhere else. The Southeast or "Deep South" is one of the richest "floristic regions" on our continent, famous for rich soils, moderate temperatures, and a very long growing season. With a wide network of wonderful rivers & creeks, the south is the ancestral home of scores of annual & perennial wildflowers, plus many of the world's most famous rhododendron species. High altitudes and a lack of heavy rainfall create the unique wildflower environment of the intermountain West. Spring comes late and frost early in the high mountains, but even with a short blooming season, truly spectacular displays of wildflower color and a wide variety of species are botanical hallmarks of the region. No wonder the Lone Star State brags about its wildflowers. Every April, certain parts of Texas light up with a wildflower show no other state can match. Take a tour with a local expert. Katie Sherrod, a noted journalist from Fort Worth, sent us this on-site report in April 2005. Go with her on her tour of the famous Texas Wildflowers during the Big Bloom—it always happens in April.